I started the month with a Silent Video and sang”I Know That My Savior Loves Me.” The children were quiet and attentive. They heard the whole song without really knowing it. The next week I moved with the younger children to the same song using the Sway and Freeze activity. The flow and beat of the song went into their body with the experience. Now I’d like to do something visual that has the children totally interacting with the images, instead of passively viewing them. Three Piece Puzzle fits the bill. 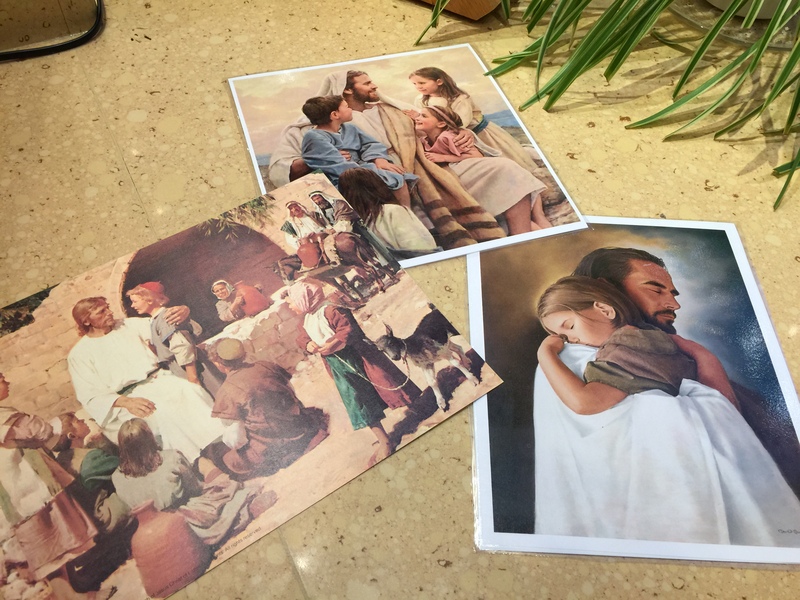 I copy three pictures of the Savior, preferably with children in the pictures. I mount the pictures onto card stock or cardboard. 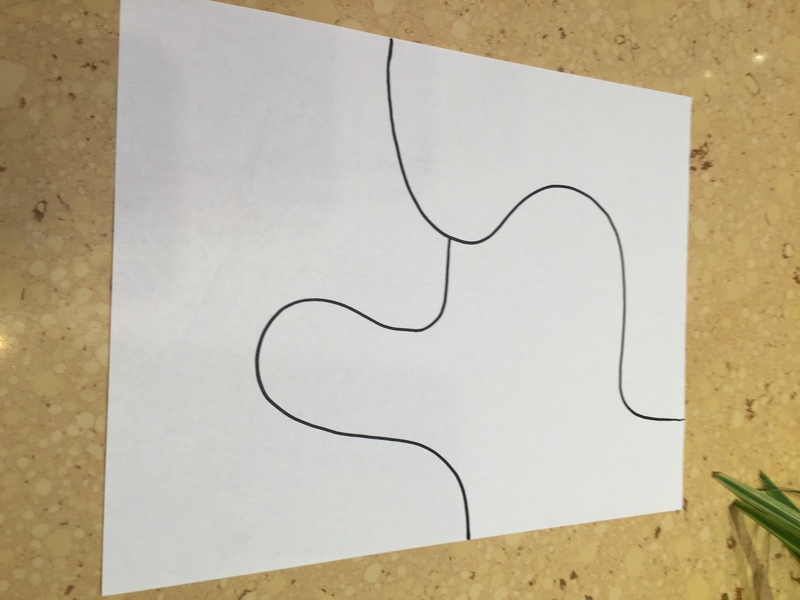 I make a puzzle template out of a piece of 8 x 11 paper and trace that template onto the back of all three pictures. I cut the pictures apart so that each becomes a three piece puzzle. 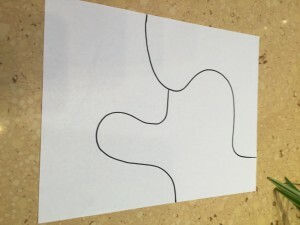 I use tape or sticky magnets to tape the pieces all mixed up at the front of the room. I tell the children, “I have some puzzles in the front of the room, but they are all mixed up. Will you help me put them in order while I sing the song? I will tap you on the shoulder to choose a puzzle piece and put it where it goes.” I start to sing and tap two children on the shoulder. After they have put up their puzzle pieces, I tap two more children on the shoulder. I continue singing the song and tapping children on the shoulder until all the puzzles are put together. I still have a little time so as an extender to keep challenging the children, I use the Inside Chalkboard activity. I give the children five seconds to memorize the images, then I take away one of the puzzles. What were the colors? Was there an animal in the picture? How many people are there? The children respond. I ask them to sing the song with me and remember what the picture was as if they had put it up on their Inside Chalkboard. If there is time, I can repeat the process with the other puzzles. Note: I can do this activity with older children, but I put up as many as seven different puzzle pictures for them in order to challenge them. My dear friend Linda Orme of 13 years, shared this website with me. What a wonderful surprise to not only learn that you were related, but to have this website available. It’s fantastic! When I shared the website with my sister, who is arguably one of your biggest fans, she was genuinely more excited then I can ever recall – that’s not a exaggeration. You are such a wonderful source for us all. A million thank you’s just doesn’t seem to suffice. You’ve literally changed lives with your joyful approach to learning. Music leaders can’t wait to teach and children are fully engaged in learning. It’s a huge win-win! For years, I have used your tips and tricks in teaching primary music and the kids have LOVED it all! Adults too! In fact, I’ve been asked again to teach another stake primary leadership music workshop where I share many of your ideas – it’s our california attempt to get what Utah gets readily :). Rest assured, I gladly give you ALL the credit for each and every idea with thanksgiving! Having worked privately with families with special needs, I am especially appreciative of your emphasis to cross the midline, use creative repetition to bring in the melody and rhythm through the back door, etc. It is powerful to have activities that engage all learners. I’ve taught a few children who were nonverbal. The clapping, humming, shaker, scarves, etc. allowed these sweet, adorable children to participate and truly let their light shine (they would smile from ear to ear the minute I encouraged movement and instantly focus.) Again, I don’t quite know how to articulate the impact for good you’ve had in my life and those within my circle. THANK YOU for going WAY ABOVE THE CALL and sharing SO FREELY all that God has blessed you with. We are all blessed because of it!